They say that laughter is the best medicine, and to have a lighter outlook in life is always better. After all, why go to the grave with a scowl on your face? ThinkGeek has an interesting remedy for those who want to take down their heart pulse, thanks to the Smart Heart Pulse Monitor. Not only does it allow you to hear your own heartbeat, it also will go about calculating your pulse so that you have a better idea on what kind of shape you are in physically at the moment. The Smart Heart Pulse Monitor is capable of checking your heart rates, and using it is a no-brainer. All you need to do is hold it over your heart and press the button for a few seconds in order to hear the audio computation of heartbeats per minute. Not recommended for those who are under 3 years of age. Bear in mind that this is not a medical device, so if you need something more professional, then you would do well to purchase a real heart rate monitor. 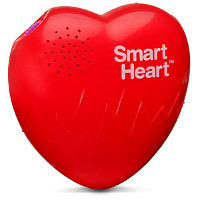 Powered by a trio of AAA batteries that obviously haven’t been included, the Smart Heart Pulse Monitor is going for $24.99.